For these reasons we have partnered with Vimeo to distribute our educational products. Vimeo is a well known trusted company with a track record for dependability. Below we will explain how to go about purchasing and accessing content on this site. We have partnered with Vimeo to bring you the most versatile dependable system available. After selecting a title you would like to purchase, you will be taken to a Vimeo page to make your selections. You can choose to rent or buy the content you have selected. Rental durations will be stated on the buy page. You will be required to create a Vimeo account to complete your purchase. You can use a number of ways to pay including PayPal and Credit Cards. I know...Awwww not another account with another password... but wait! Once you have a Vimeo accout you can access your video almost ANYWHERE!!! 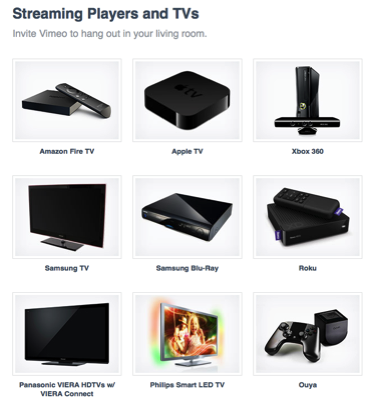 Below are the devices currently that work with Vimeo. You will also recieve an email with a link to view your purchases on your computer or simply going to vimeo.com, logging in and going to the watch later tab. So here are your choices... Rent it and stream it as often as you like for your rental period or Buy it and stream whenever you want or download and own it. The Choice is Yours. 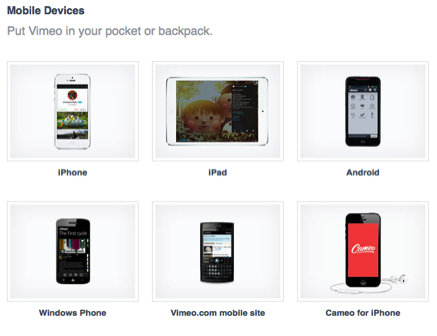 Devices may require you to download free Vimeo App.